By: Bridgewater, A. 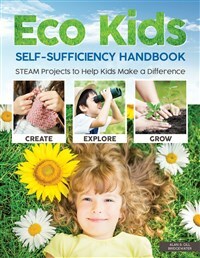 & G.
This exciting project book for children aged 7-14 combines creative play with eco-awareness, while supporting STEAM learning (science, technology, engineering, art, math). Twenty-eight fun ideas range from building a wind turbine and a go-kart to creating light, growing vegetables, making green gifts, and more. Alan and Gill Bridgewater have gained an international reputation as promoters of the self-sufficient lifestyle. They produce gardening, woodworking, and DIY books on a range of subjects, including furniture-making, hand tool techniques, stone and brickwork, decks and decking, wood-carving and woodturning. They have written more than 50 highly successful books to date, including The Self-Sufficiency Specialist and The Wildlife Garden Specialist. Alan and Gill frequently contribute articles and designs to national magazines.